Mark Sanders, an industrial engineer from England, strikes me as the epitome for all engineers in this day and age. His design philosophy is very practical. Hardwork, innovation and simplicity are keywords in his process oriented design scheme. Thanks to MAS Design for the video. 1. The conceptualization phase of design is very important. I've had to think about this in school last year a LOT when in my senior design project. You have to first think about what you want, and what the problem is! Observe the rough specifications of the bicycle in the early part of the video. This is the time you're literally grappling with images and alternative solutions. There is no ONE ultimate solution to a real world problem. Pictures and words and ideas (obtained from unbiased brainstorming) are solid ways to emphasize that thought process. And another reason why its important is that this is when you have a lot of levy to make things simple, look at alternative solutions and really affect the costs of production in a big way. Once something is out on the manufacturing floor to be made, you can't waste time and money to go back to the drawing board. This is a great video and I wish it were to be shown in engineering design classes. If you're interested in Strida, look here for more information. 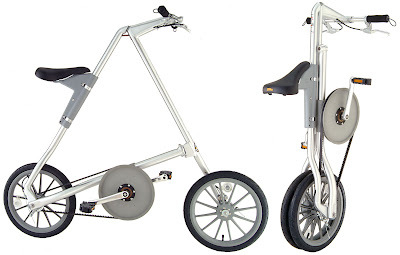 The folding bike doesn't look like it steers at all, or at least not very well. What is the weight of this bike? What is the cost of this? It looks lightweight and durable. I believe there have been incremental models ever since the first one shown in the video. So there may have been improvements but I'm not sure. i have strida i realy love it! a black one!